Best of Missouri Hands is on Instagram! For all our artists using Instagram make sure you let us know your page name. We want to follow YOU! Also, be sure to follow our page at Best of Missouri Hands. 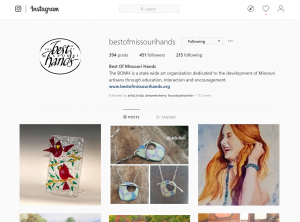 Feel free to use the #bomh and/or #bestofmissourihands when you are sharing your artwork and creations on Instagram. Help US, Help YOU....tag and share! Did you know we have an Instagram pro on the board....Our very own Marcia Menendez handles our Instagram page for us and she also teaches mini workshops on how to use Instagram. If you need help or just want to learn more about the power of Instagram, simply contact us....Marcia is more than happy to help you get started sharing and marketing your art on Instagram. Look for more details and registration opportunities soon.